Gulet charters - Gulets cruising holidays and crewed yacht charters Croatia. Many visitors have already shared their gulet charter experiences in Croatia with me and you could help others too by reporting your own gulet experiences. These reports show that only a fraction were quite satisfied, moreover, too many were certainly not happy with their gulet charter company. Yet, they have found those few trustworthy gulet businesses, with prices that are very competitive. The idyllic blue cruises are historically enjoyed along the Turkish coasts (the Turquoise coasts like Caria and Lycia) and the Dodecanese in Greece. But now also other areas like the Ionian in Greece and of course myriad of islands in Croatia and Adriatic are ideal. If you would like me to help you pick one of those trustworthy businesses and to prevent you from embarking with known troublesome companies in Croatia or the Adriatic, please fill out the following form. Children? How many crew do you require? All info helps. Contrary to normal crewed charters, the gulet cruises are usually package holidays and the extras like linen, windsurf board, dinghy, outboard engine, transfer from the airport will be included into the charter fee. Moreover, you can also include the gourmet dinners on board! Port fees, diesel fuel, etc should be included as well. Each couple will have their own private master cabin with ensuite toilet and shower. Gulets vary from 16 to 35 m in length and have large forward and aft decks, ideal for sun bathing. A crew of three at least will be at your disposal : captain, cook and deckhand, quite often more (hostess, etc). Despite the variation in length most gulets have accommodation for 6 to 16 guests in 3 to 8 cabins with double hotel like beds; a few gulets can even accomodate 20 or even 24 guests. Many visitors have already shared their gulet holiday and by taking the time to fill in the following form you too can help other visitors finding a reliable and trustworthy company. Your report will be treated strictly confidential and will therefore not be passed on to the corresponding charter companies or any other party. Thanks for your time ! Name of Gulet? Route? Did the crew live up to your expectations? etc. Details on gulet cruises in Greece and Turkey. Sailing in Croatia and the Adriatic Sea. 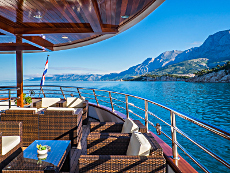 Luxury crewed charters on mega yachts and gulets. Indispensable books about (sailing in) Croatia, Greece and Turkey.